"For generations, the elves sought a safe haven against all who would do them harm. But the dream that Chief Cutter and his Wolfriders fought and died for, the Palace of the High Ones, may be the very thing destroying them. The skills that helped them survive the harsh world are fading, and there is a growing threat from a tyrant obsessed with exterminating all elves--creating a disastrous brew that must surely boil over. 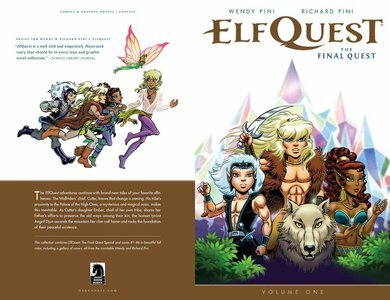 Volume 1 collects Wendy and Richard Pini's sixty-page special and the first six issues of The Final Quest, the newest adventures of the Wolfriders! ""Even with a bit of a slowdown in pace, Wendy and Richard Pini's "